September 1st is an auspicious day in the Harry Potter series. It marks the moment Harry can escape his abusive Muggle family and return to Hogwarts School Of Witchcraft And Wizardry, a magical safe haven that’s constantly infiltrated by his murderous enemies. 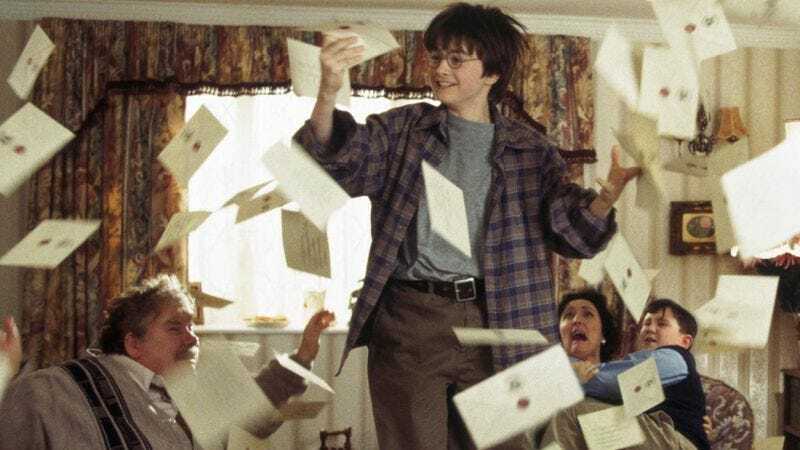 Much as Star Wars fans have claimed May 4th as their own, September 1st is an unofficial Harry Potter celebration day for the series’ fandom. Right now the #BackToHogwarts hashtag is trending on Twitter to mark the fact that in the world of the series, the Hogwarts Express pulled out of King’s Cross Station Platform 9 ¾ at precisely 11 a.m.
As Rowling indicates, it’s not really surprising that James wound up in Gryffindor, but it’s nice to see Teddy Lupin (the son of Remus and Tonks) take on the Cedric Diggory role of unexpectedly attractive/competent Hufflepuff. James is followed to Hogwarts in two years by his brother Albus Severus (as seen in the Harry Potter And The Deathly Hallows epilogue) and two years after that by his sister Lily Luna, so Rowling has a couple more Potter offspring (not to mention Ron and Hermione’s two kids) to see off to school before she’s truly an empty nester.